← Guardians of Music AIRS on March 16, 2015! Today I tweeted an article which really caught my attention regarding the creative process. The Messy Minds of Creative People was written by Scott Barry Kaufman. What intrigued me about his article was his relatively simple and direct approach in showing the reader that to be creative – invokes a wild number of potential emotions. Sometimes rationale and sometimes irrational behaviors. 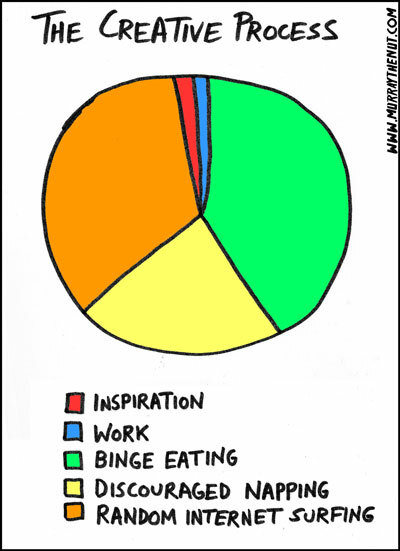 This is something I can honestly say I can easily identify with when it comes to the creativity process. It is indeed a process and when we read or hear artists talk about their craft and how they go about being inspired to create, we tend to envy their approaches and find that it must be a very simple approach to be creative. Quite the opposite is true. I feel that anyone has the ability to be creative and at times it can be easy depending on the task or project, others may labor over something for weeks to months to years. So as I write this blog entry, I think about the film documentary I am finalizing, Guardians of Music and the mix of emotions and thoughts that have gone (and continue to fester) through in order to complete my project. I find myself having the same fears and other emotions that would change on a dimes notice. The graphic that I include in this is both humorous and somewhat accurate when it comes to my approach to create. The main theme of the graphic suggests that very little of it is inspiration and that we involve other outside distractions in order to move our way towards the creative phase. Initially I figured it was a type of Attention Deficit Disorder. Perhaps that is part of the overall process, but I can see that for me, I have a systemic approach in creating. It helps to be able to have outside parties comment on the progress and in my case with this film, I had my documentary editor keep me “in check” if you will. I have “created” before, but never a documentary. It was an eye-opening experience and changed how I would approach my creativity. It allowed me to produce without a narrow focus that wouldn’t allow for constant change. I constantly seek input and for the most part, I will be open-minded to alternative approaches. Sure, like everyone, I would get stuck in areas, but eventually the flow would move again. My major takeaway is that emotions play a crucial role in the entire creative process and successful creativity includes a variety and unrelated emotions that may never appear to be rationale behavior. In the end. like moth things, we take a side step once a process is complete to view how the process was achieved and what outcomes it produced. In the end, I think you will find you made smooth decisions. I know I did. This entry was posted in Uncategorized and tagged add, creative, creativity, emotions, focus, process. Bookmark the permalink.